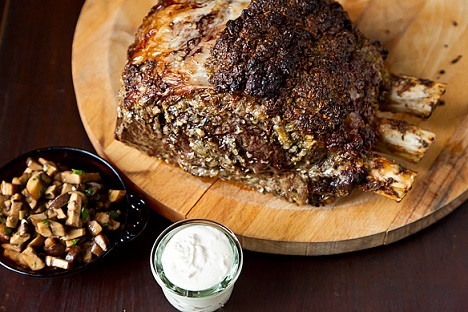 A Prime Rib Roast makes an impressive meal anytime you have a group to please. It is especially popular on holidays. As delicious and impressive as prime rib is, it is easier to prepare than many other holiday foods. Your primary task will be NOT to overcook it. Please keep your meat thermometer at your side. A digital probe thermometer is best. 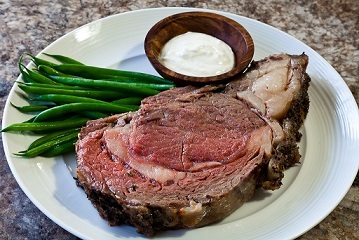 Prime rib is a favorite meal, at the restaurant and at home. "Prime" and "Prime Rib" actually mean two different things. "Prime" is the top grade of meat as graded by the United States Department of Agriculture (USDA). That grading is based on several criteria including the amount of marbling (fat content that adds flavor but is also cooked away). Other good grades are "choice" and "select," in that order. "Prime Rib" refers to where the cut of meat came from - the rib area. The rib area of the animal has less gristle (connective tissue) than many other cuts of meat. Less gristle means the meat should be more tender. You can purchase prime rib with the rib bones (a standing rib roast for example) or with the bones removed (boneless rib roast). I personally love both, but when it comes to carving, the boneless rib roast is my preference. You can slice off thick portions, or thin portions - whatever your guests desire - without encountering a bone. Because prime rib (especially "prime" - prime rib) is so tender and flavorful, seasonings are often very simple - sometimes just salt and pepper - and then into the oven it goes. For this particular recipe, I add a little garlic and a little thyme and rub these ingredients, along with the salt and pepper, over the roast (Give your roast a "massage"), put it in the oven and watch it cook through the "eyes" of a good probe thermometer. How do I roast a prime rib at the restaurant AND at home? First, remember to remove your roast from the refrigerator about two hours before you are going to cook it. This will allow it to cook "evenly" throughout. And I believe dry heat is best (no cover - no liquids) to cook your prime rib simple because this cut of meat is already tender. Also, remember to remove your roast from the oven in advance of the desired temperature. Your prime rib roast will continue to cook and be about 5 degrees higher than the thermometer says after it is removed from the oven. 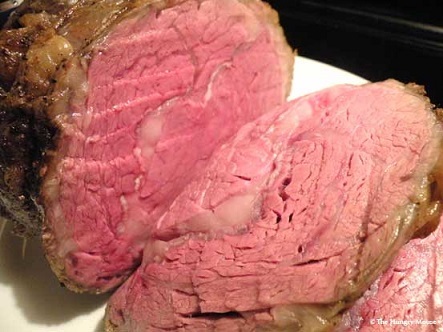 For a medium-rare roast, remove it at 130 degrees F ( internal temperature), for medium - 140 degrees. Note: Internal temperature of meat will continue to raise 5 more degrees during standing time. Serve this wonderful entree with Horseradish Sauce, a traditional and delicious accompaniment for prime rib, as is au jus. 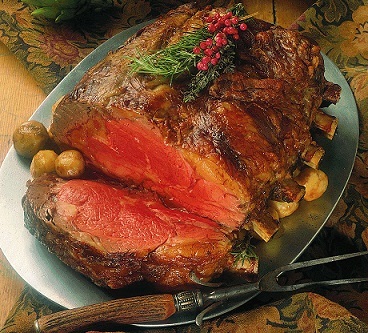 Enjoy your Prime Rib Roast and the company of those you share it with!